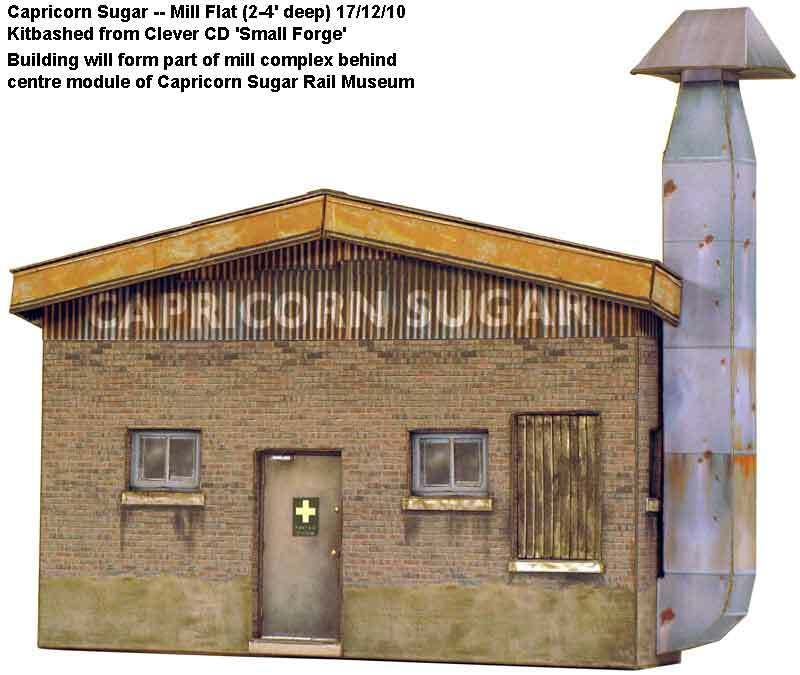 The Capricorn Sugar Rail Museum started as a small exhibition based on three light-weight micro-modules constructed using foamcore board in photoframes with recessed wooden bases. 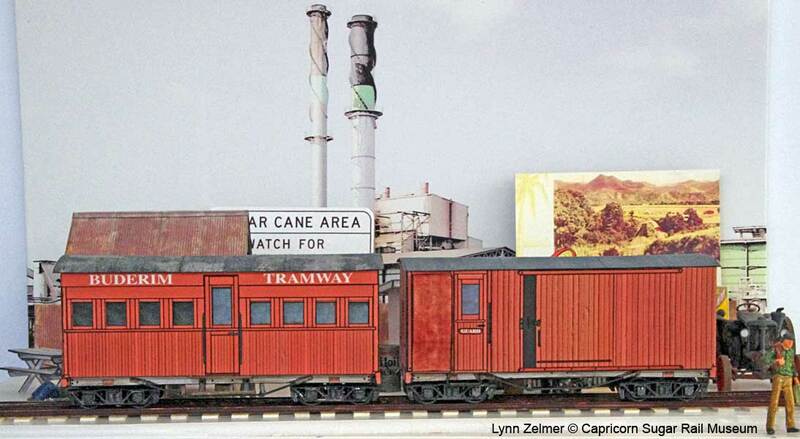 Built to 1/4" scale (1:48), its track gauge of roughly 30 inches (On30) represents the two foot gauge track of the Queensland shire and cane railways (historically called tramways). 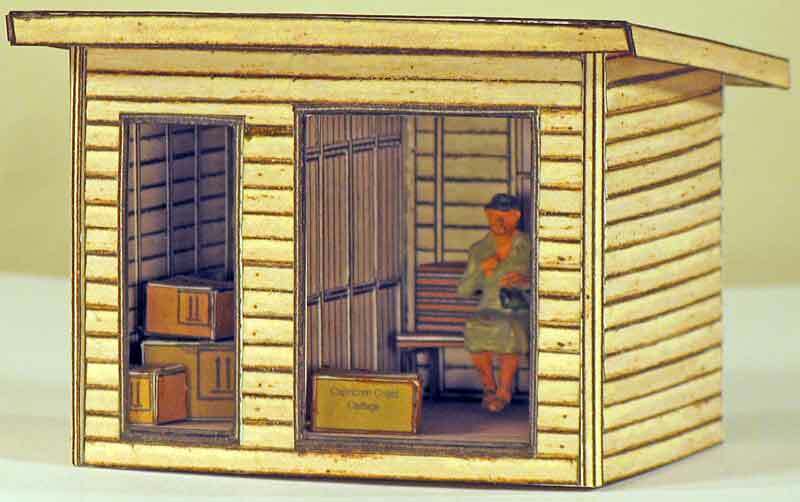 The need for travel via public transport or a compact auto meant the layout had to be small, easily transportable and modular. At least one module had to be self-sufficient, that is able to be run continuously, and fit inside an existing plexiglas cover for security around small children. The use of micro-modules also required locomotives, rolling stock and structures to be small while remaining typical of Queensland shire or cane railway practice. The modules were exhibited three times at the Brisbane Train Show (2009-2011) as well as at the 2011 Australian Narrow Gauge Convention. 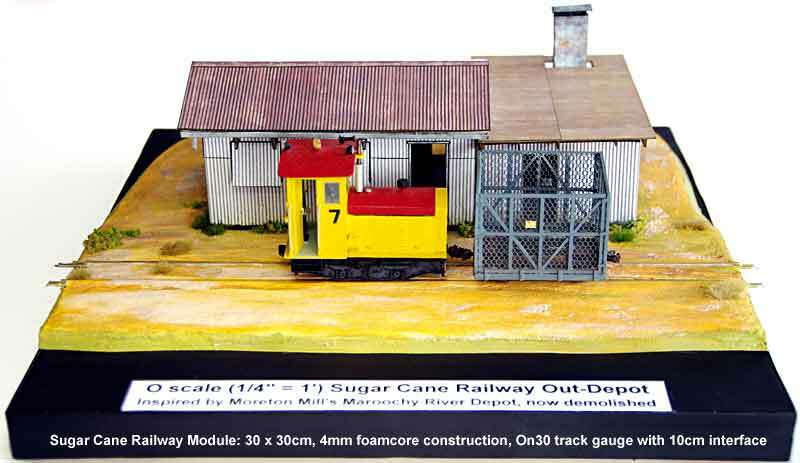 Australia's Narrow Gauge Downunder magazine has also featured the layout several times. 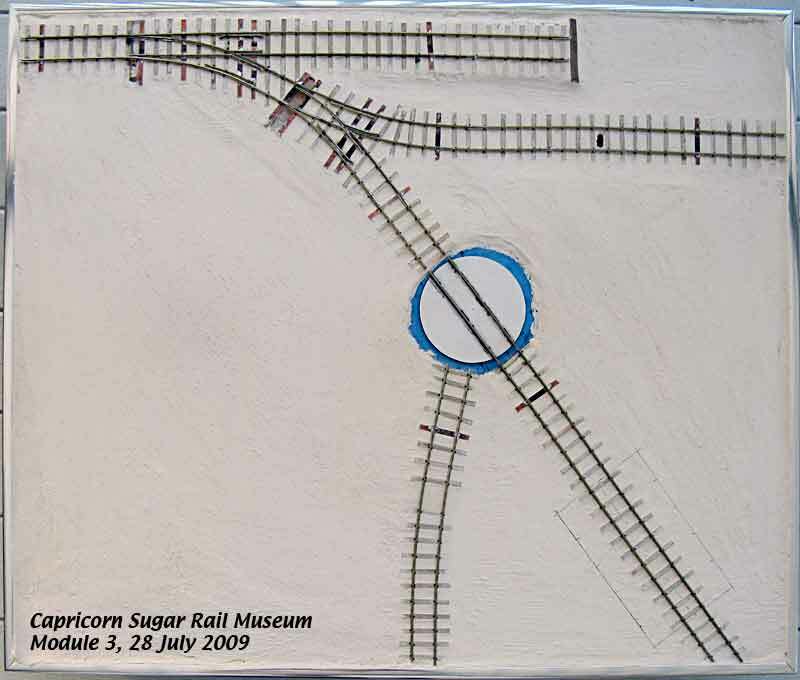 Never intended to be 'finished', since its purpose was to show On30 construction techniques, the layout has been retired and two of the three modules dismantled. 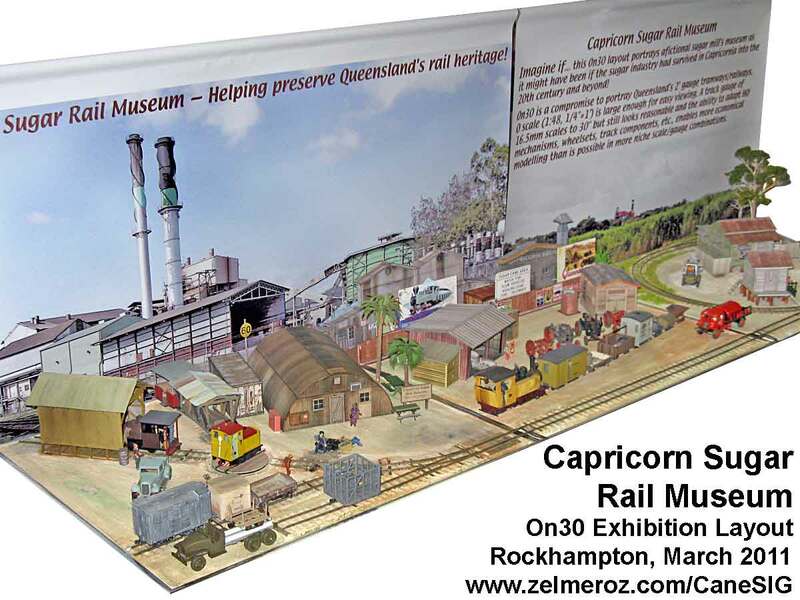 However the fictional museum will endure: the loco shed module has been retained and will continue to be exhibited in Central Queensland. Many of the models will find a place on my home layout, and I will continue developing O scale models that fit the concept. 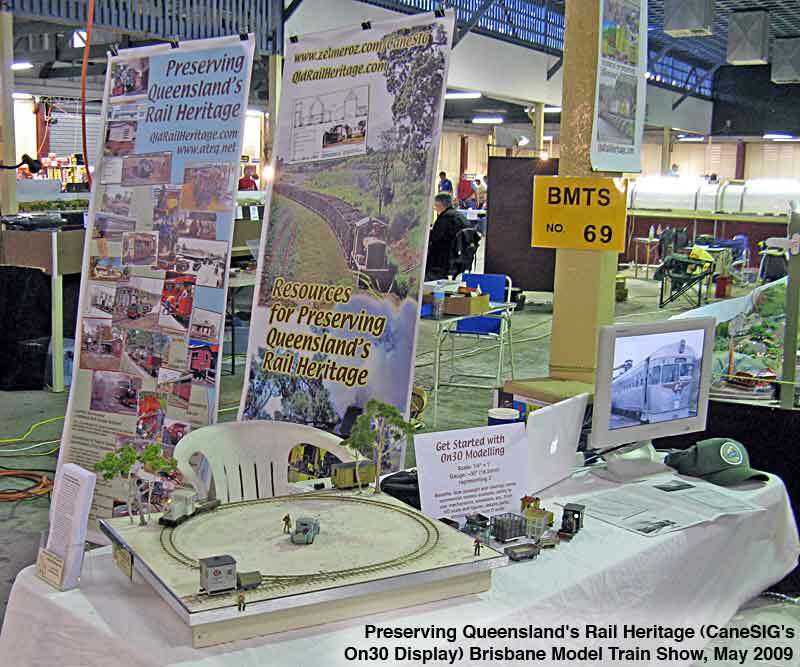 Getting Started in On30: a four page handout (pdf file) from the 2010 Brisbane Train Show describing the layout, its construction and operation. The home page head image shows the general plan of the layout and its progression from design to basic scenery and finished module. 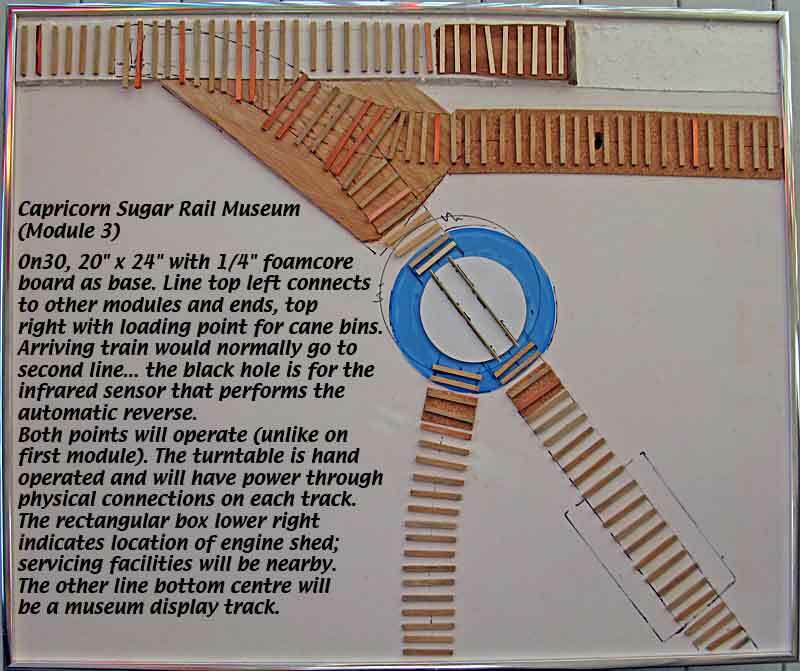 Additional construction details can be found in a series of articles written for Narrow Gauge Down Under magazine in 2011-12. The modules are constructed from extruded aluminium with 1/4" foamcore board as a working base. A recessed finger joint pine frame raises the module for wiring, electronics, etc, to be fitted underneath. Roadbed is normally another layer of edge tapered foamcore board but cedar shingles are used at grade changes and some track is laid direct on the base. Sleepers are 12' long Mt Albert switch ties (scale 5" x 7") cut in half with some hand cut PC board sleepers at critical gauge or power points. The track is oversize for narrow gauge but was chosen to minimise operating problems at exhibitions. Nickel silver rail lengths were stripped from inexpensive HO flex track and spiked in place with code 70 spikes. Scenery is plaster impregnated cloth covered with a mixture of plaster of Paris and 'Todd River Sand' coloured grout. Flexible joint filler is used along the outside edges to reduce breakage in shipping. Surface colouring is primarily artists' water colour, although some areas have also been stained with a solvent base. As is indicated elsewhere, two of the three On30 modules have been dismantled and the structures, etc., salvaged. In 2014 I started working on a lightweight On30 module system more suited to transport via public transport. Based on a 300mm form factor, they are primarily constructed of black foamcore with fingerjoint pine stiffeners. A single through track is set back 100mm from the nominal front face. If multiple tracks are used (passing loops, etc.) the modules at either end of the must have only the single through track. 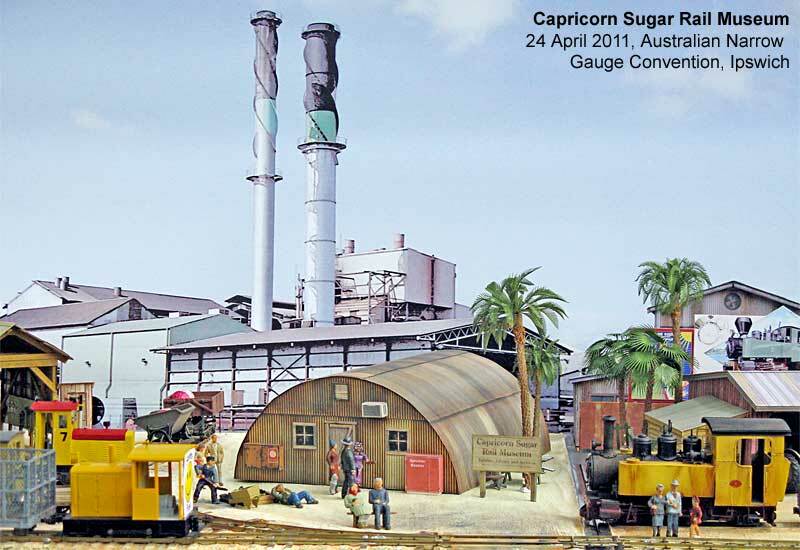 The first module, with its photorealistic card structures permanently mounted theatre-style, represents the now demolished lunch room and sand dryer at what was Moreton Mill's Maroochy River Depot. It does travel quite well, although I haven't yet built a proper carrying case, and displays well with a low photographic backscene. 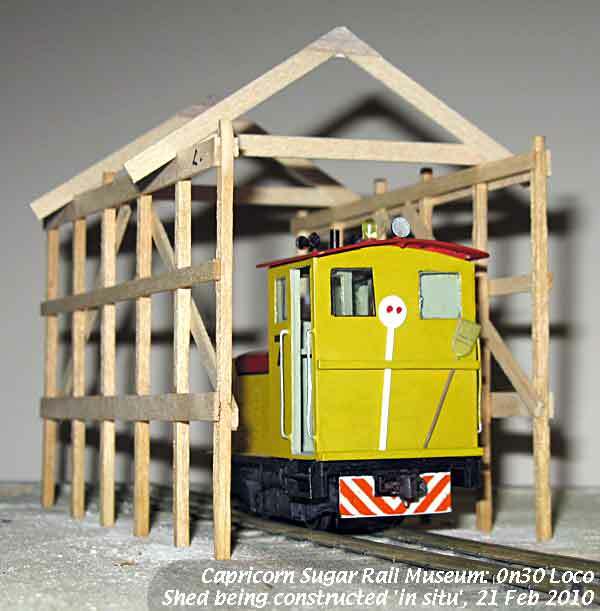 The scratchbuilt pole shed was constructed in situ with scale lumber, timber poles from extra long match sticks, and scale size metal foil corrugated iron sheets. Both timber and ironwork was hand painted with acrylic paints. The floor is scale lumber and the tool board contains both hand painted tools and computer-printed signs. The loco shed poles are force fit in their mounting holes so that the structure can be removed for shipping. The unpowered turntable is a micro-CD with a timber texture deck. 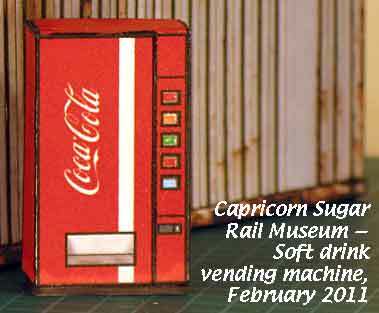 Late 2010 I started building structures using a modelling material, printed card, that I hadn't touched for several decades. 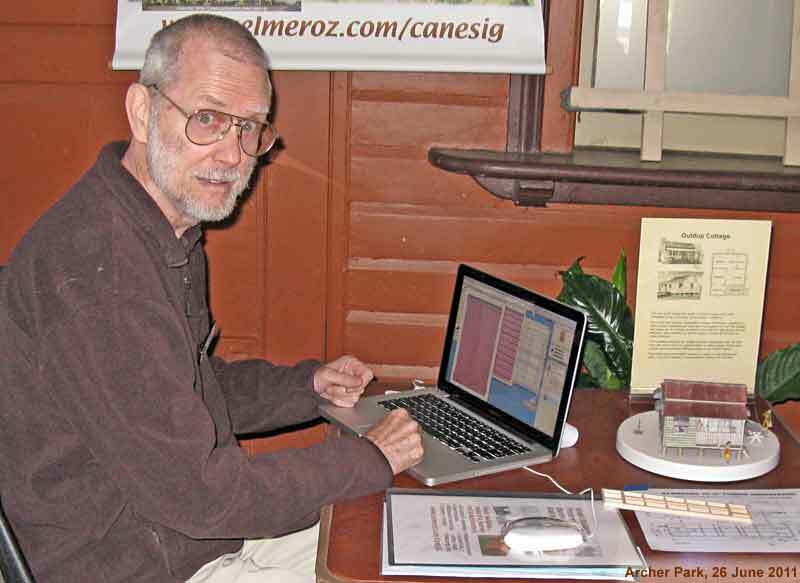 Yes, like many others with a limited budget in the 1950s-60s, I had built a number of card kits (from books of kits or car sides in Model Railroader magazine). I had also tried card as a scratch building material, but found styrene easier to work with, albeit more expensive. Queensland modellers such as Jim Fainges, Ron Aubrey and Bill Blannin tried more recently to entice me into using card kits printed via the computer for building structures. I tried building a couple of their models but to my mind at least, the results were too sterile as they lacked subtle shading and fine detail. 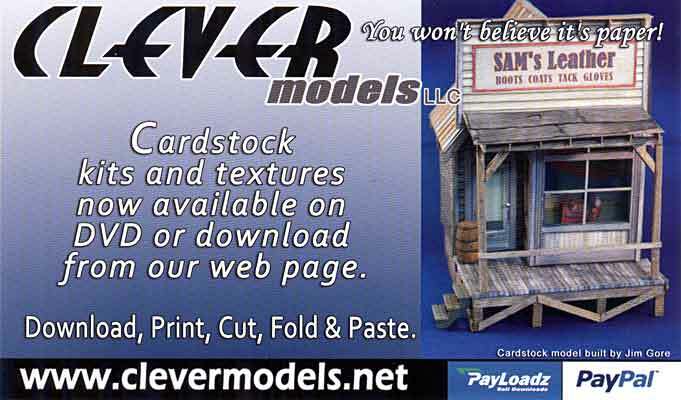 Photorealistic card kits, on the other hand, do have subtle shading and as much detail as can be printed via the computer, cut out and pasted onto the base model. A 3D effect results from the cut and paste of individual components (windows, doors, door knobs and hinges, and even individual boards), potentially giving results comparable to more traditional scratch built or kit components. 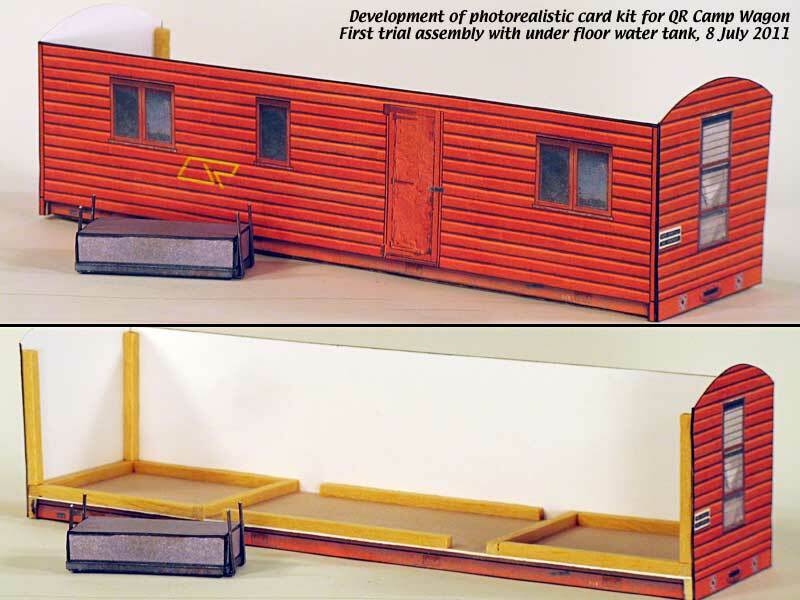 Paper Creek Model Works, now no longer in business, had provided my introduction to such models with their 2003 HO outhouse kit, but I never built it until early 2009. 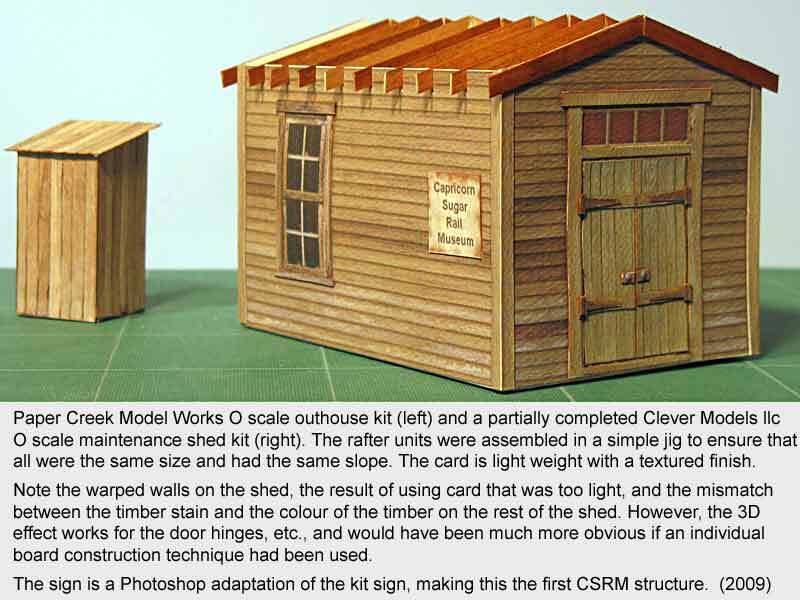 I then discovered a free downloadable kit for a maintenance shed from Clever Models. The walls on the finished maintenance shed have warped and the rafters are of timber, rather than card. I needed to use a heavier card, provide more internal bracing, learn how to fabricate individual timbers and roof trusses, but at least I had been able to customise (kit bash) the model for my particular needs. 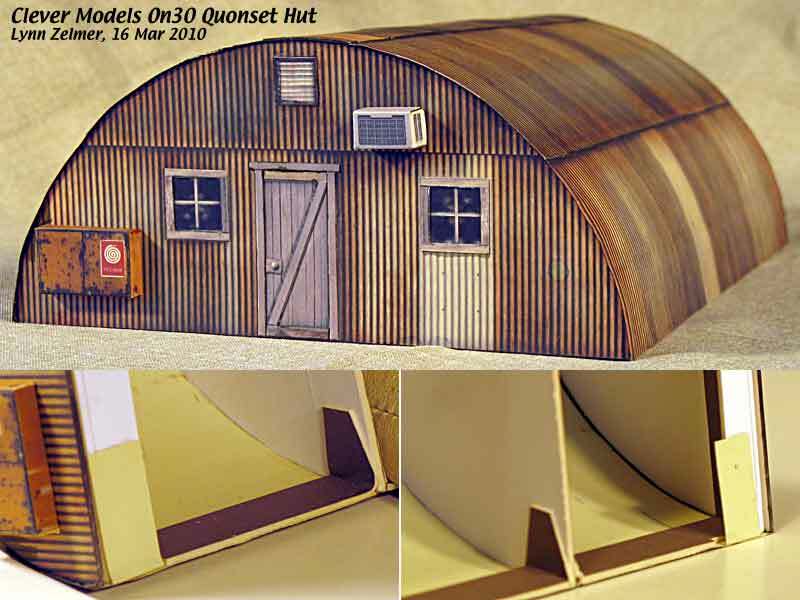 The construction of a larger structure followed, an O scale Quonset hut kit bashed from a Clever Models kit. There are office-type doors on each end of the building, rather than a large roll-up vehicle door, as well as added details such as the electrical power box (underground service in the museum precinct) and air conditioner. I also properly braced the structure to avoid the walls warping. My next card model was scratch built (or should it be classed as kit bashed?)... 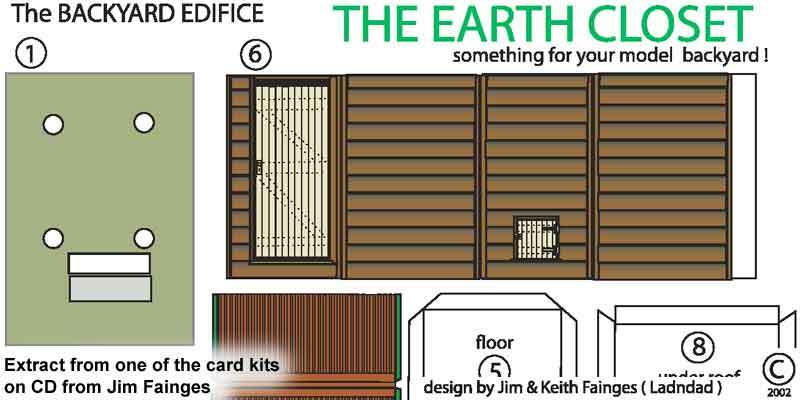 an O scale garden shed based on a kit from Ron Aubrey. 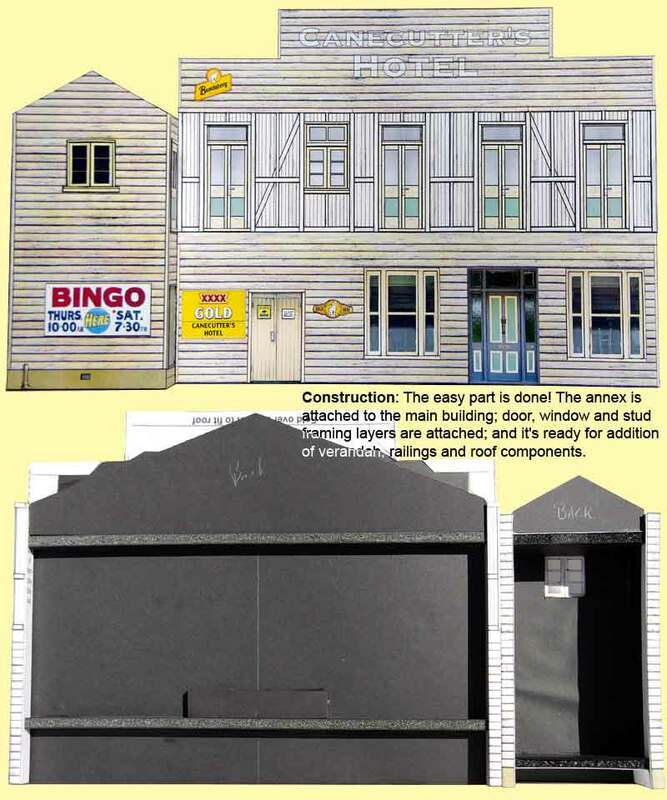 Ron's kit was scanned, then I replaced Ron's hand drawn and coloured detail with timber textures, etc., from Clever Models much as I might have used milled timber siding and commercial door units in more conventional scratch building. This gave me experience fitting the textures to the several views of such a structure, and then an opportunity to experiment with individual board construction. At some point I also tried making an O scale toilet block from scratch, albeit using textures from a Clever Models CD and some signs sourced from the Internet. For a bit of variety I used commercial metal roofing, but for subsequent models I'm likely to try replicating the texture with card. 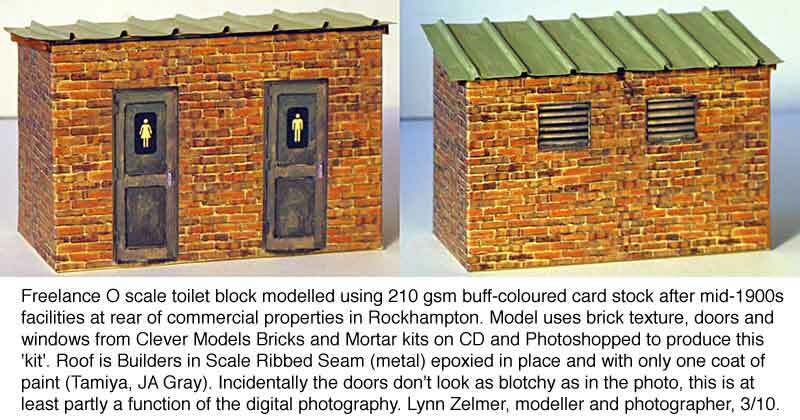 Similar structures can be found behind many of the commercial buildings in Rockhampton's CBD, some predating the reticulated sewage system. 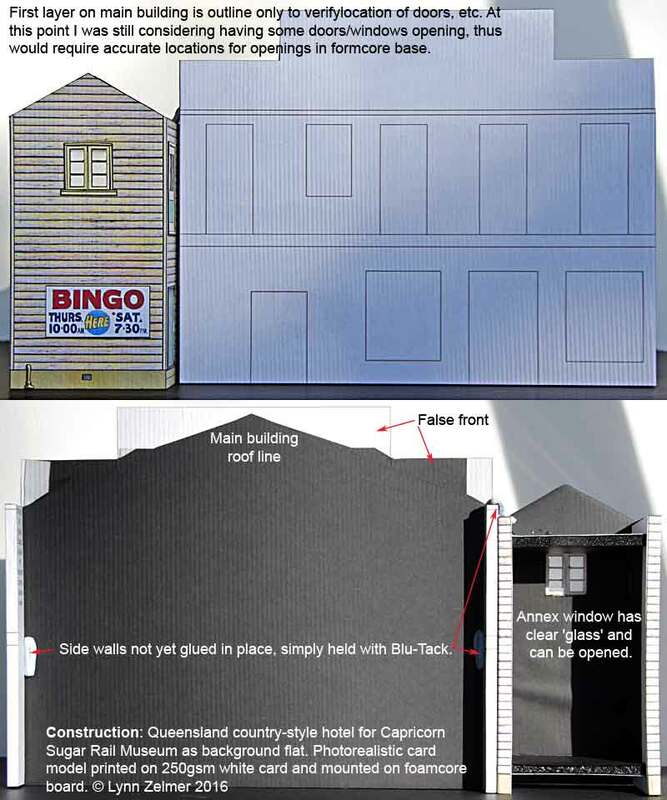 More O scale structures followed, including several scratch built Queensland specific buildings that have been turned into free downloadable kits as similar buildings are not commercially available. 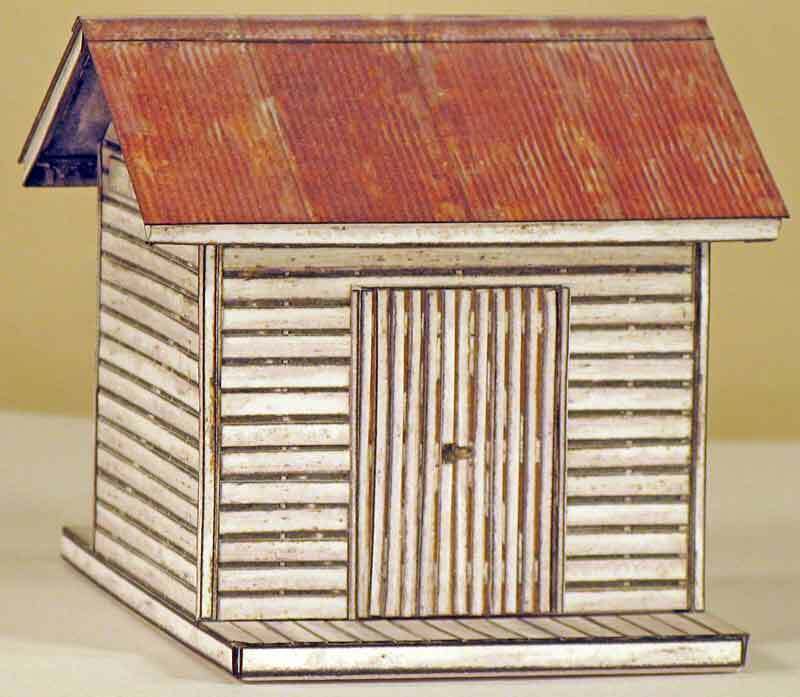 The Queensland worker's cottage was completed mid-2010 (available a free downloadable kit in HO and O scales). Over the next few months it was followed by a QR cream shed and small QR halt, both still under construction when photographed; exhibit shed: under construction - completed; 'Coke' vending machine; 20' weathered container; timber picnic tables, and preparation with backdop, etc., for the 2011 Narrow Gauge Convention and Brisbane Train Show. 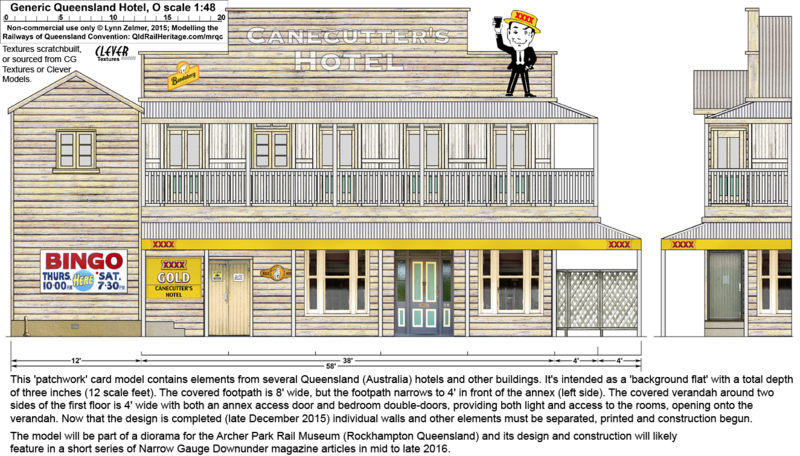 My current (2015-6) project is an O scale Queensland country-style hotel. It will not follow a specific prototype, but will include elements from several CQ hotels and other community structures. Because of its size the model will be built as a background flat, just deep enough for a covered footpath and first floor verandah, etc. The hotel design was completed late 2015 and individual walls and other elements are slowly being prepared for printing and assembly. 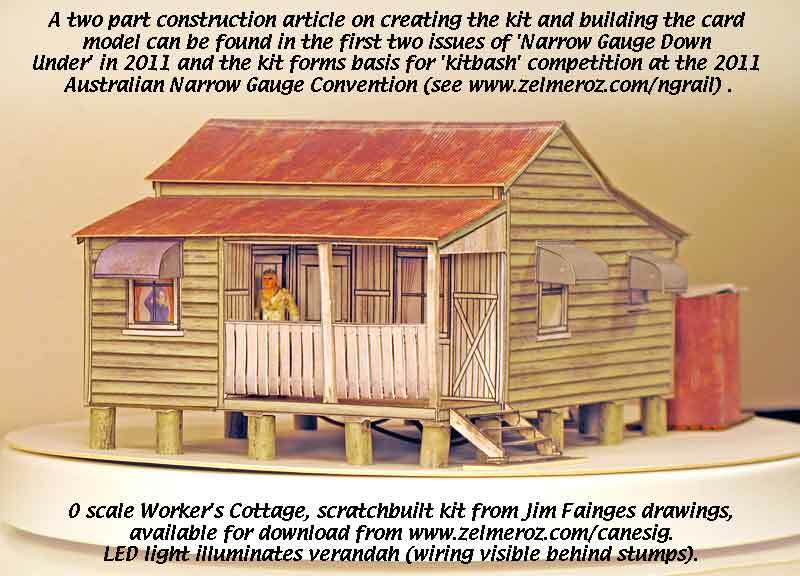 It's design and construction is being described in Narrow Gauge Down Under magazine and eventually it may be available as a free downloadable kit. Construction late 2010 and early 2011, these are shallow flats located in a 4" x 24" space across the back of the centre module: brick workshop and iron sheathed warehouse. The workshop flat is deeper on one side than the other, adding some interest and enabling the metal chimney to be modelled. The warehouse has a very shallow interior, partially detailed where it can be seen through the open doors. It has also got two pallet loads of sacked material to add more variety. Constructed from card and computer printed with photorealistic textures, the mill buildings were kit-bashed from 'industrial building' kits on CDs purchased from Clever Models LLC. 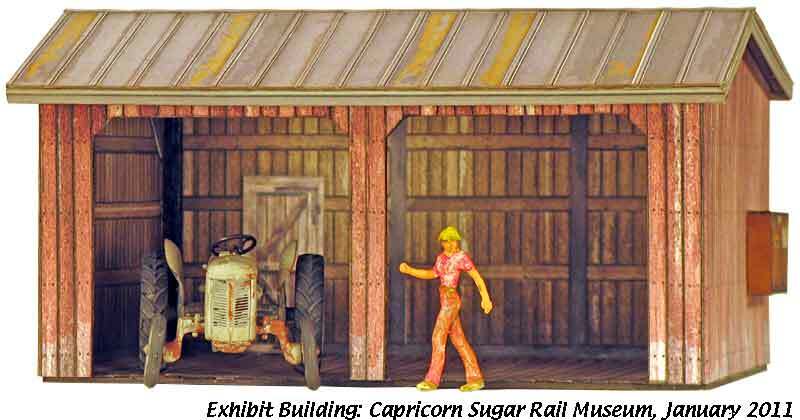 An iron fence with heritage signs separates the mill buildings from the museum precinct and the backdrop behind the models portrays additional mill buildings: 1 - 2 - 3. The layout has been an experiment for me, an introduction to basic modelling techniques and to On30 modelling in particular. Thus I haven't tried to make it 'complete' at any point... and in 2009 only one module was exhibited, and that without any finished scenery or back scene. 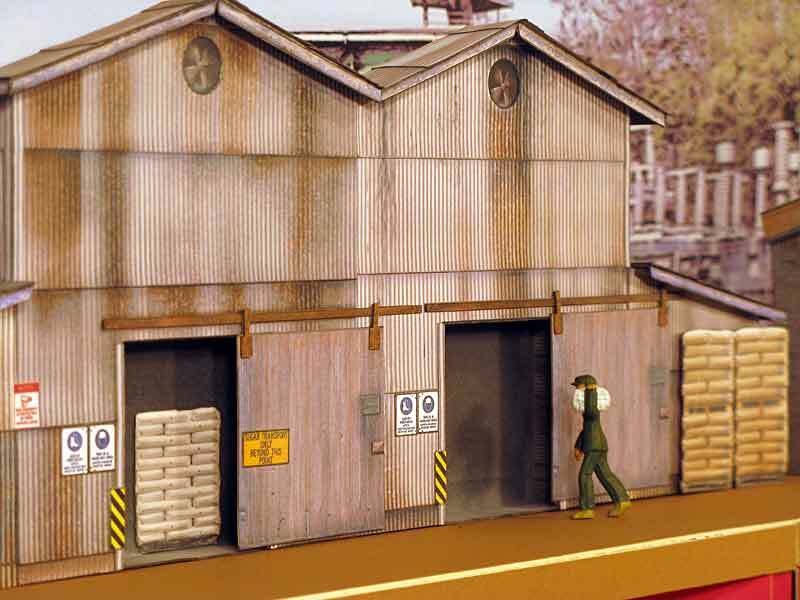 A small segment of backdrop, a scene that actually came from one of my A4 dioramas, was added in 2010. The roughly A4 image sized was mounted on 1/4" foamcore board and propped against one corner of the module, with the stainless steel of the edging providing a psychological distance between the layout and backdrop. 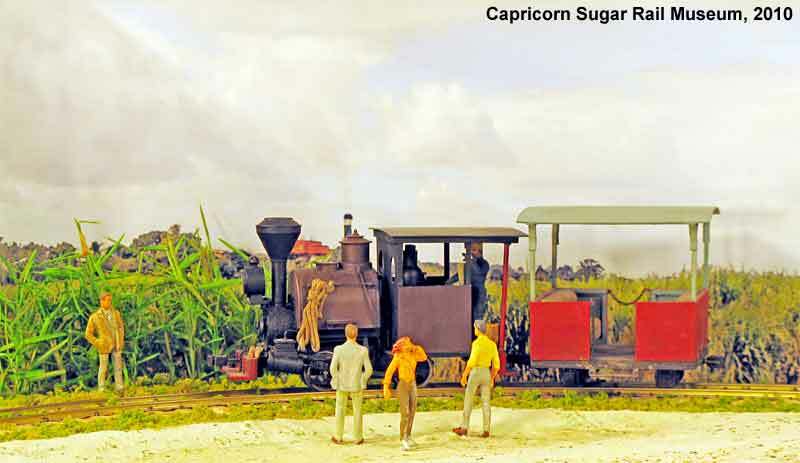 The module eventually received an expanded version of the scene, extending across the back with a sugar mill beyond the cane fields. 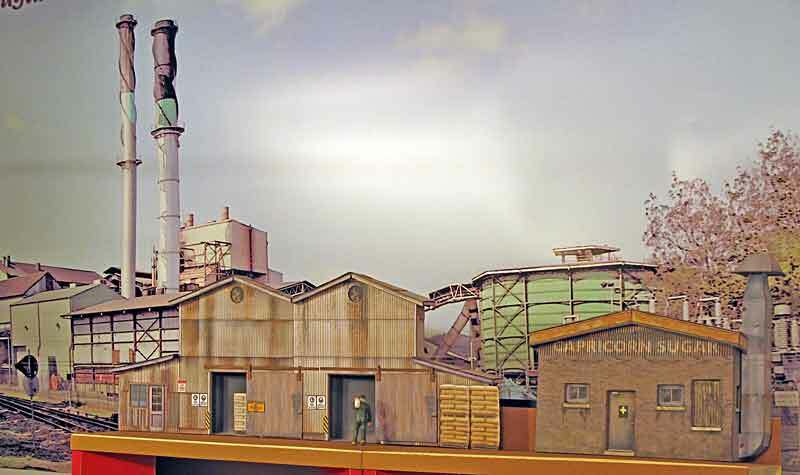 Mill buildings (a view of Proserpine Mill) formed the backdrop behind the other two modules for the 2011 exhibitions. Adults somewhat saw the backdrop as a poster, but when viewed at track height (kid height) the mill buildings sat comfortably behind the museum precinct... just 'over the fence' for the central module. 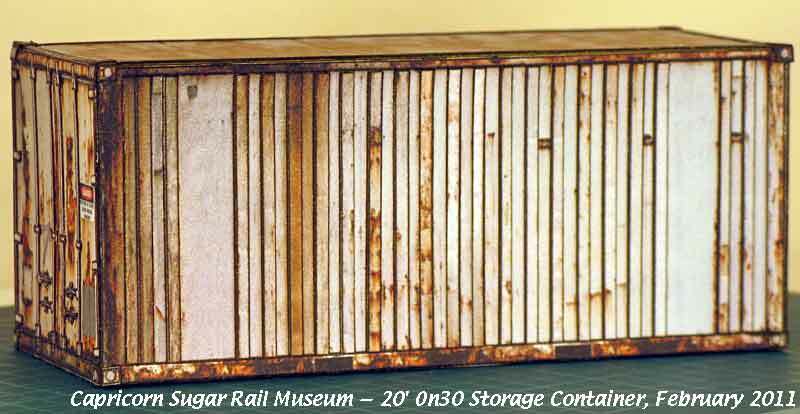 Discussions at the 2011 exhibitions indicated the general public confused On30 with HO because of the track gauge and the diminutive size of sugar cane/shire locos, wagons and structures. 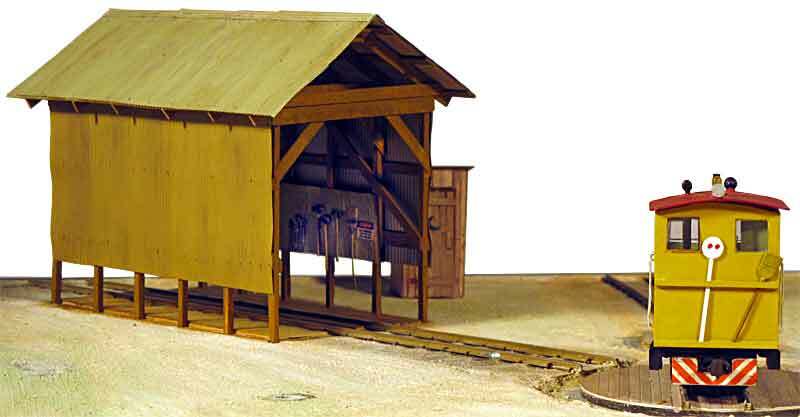 After all, a medium sized HO scale engine shed is physically larger than a single stall On30 loco shed and even a small HO station is larger than an O scale rural halt. My solution was to build one or more O scale models of QR equipment to either locate on a 'standard gauge' track on my layout or as a lineside building (navvy stores, etc.). Hopefully viewers will recognise the relative size of the more familiar QR equipment beside the cane/shire models and have a better scale understanding. 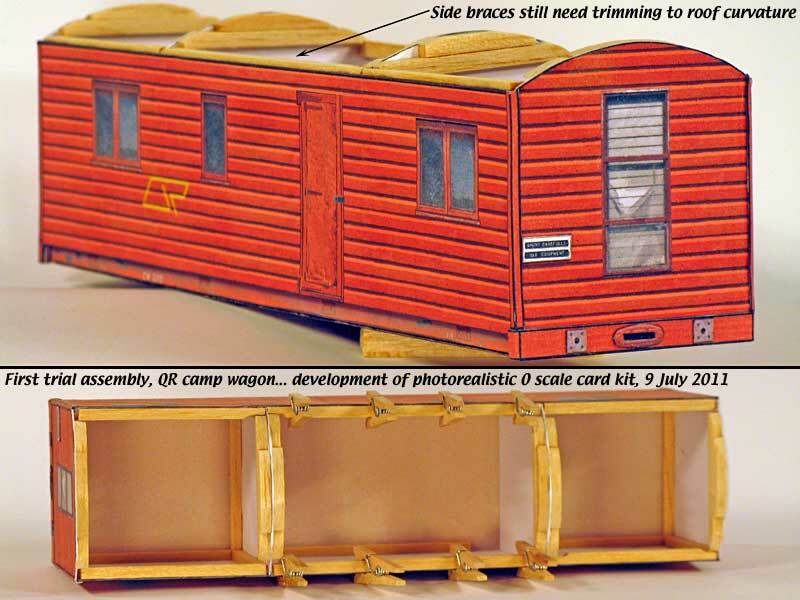 My first QR model is based on a a 32' standard foot camp wagon with timber sides and a corrugated metal roof. I'm using photorealistic modelling techniques with components from several camp wagons to develop a 'kit' for a generic wagon that can be varied to build several unique but representative wagons. Basic plan and first build construction (1 - 2 - 3). Working on the camp wagon and promoting rail heritage at an Archer Park Rail Museum Family Fun Day. The cottage (centre right) was used to explain the techniques intended for the just started camp wagon (drawing and underframe, right foreground). 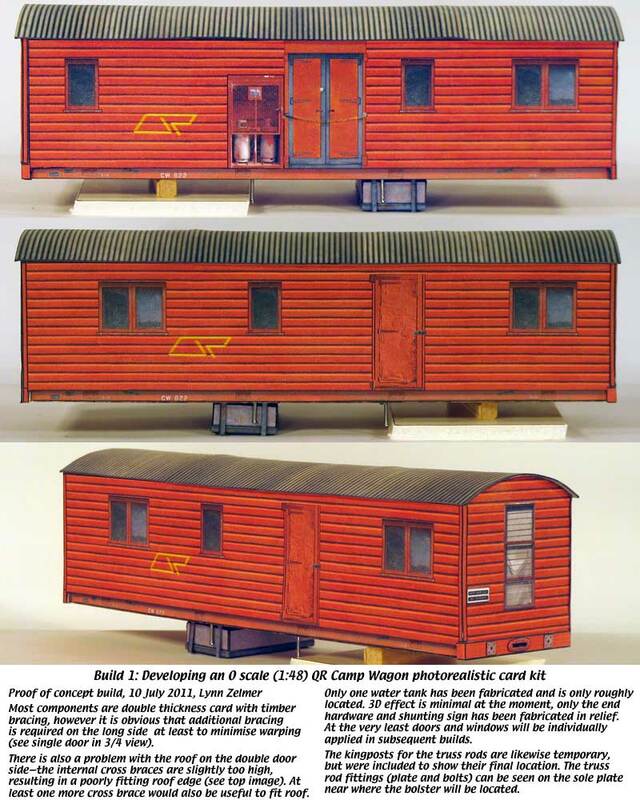 The completed O scale camp wagon displayed with the QR cream shed and fettler's shed, both of which were recently (2012) featured in Aussie modelling magazines. The minimalist diorama has trackage for On30, On42 (QR's gauge the camp wagon) and standard gauge, so that it can display a variety of models. 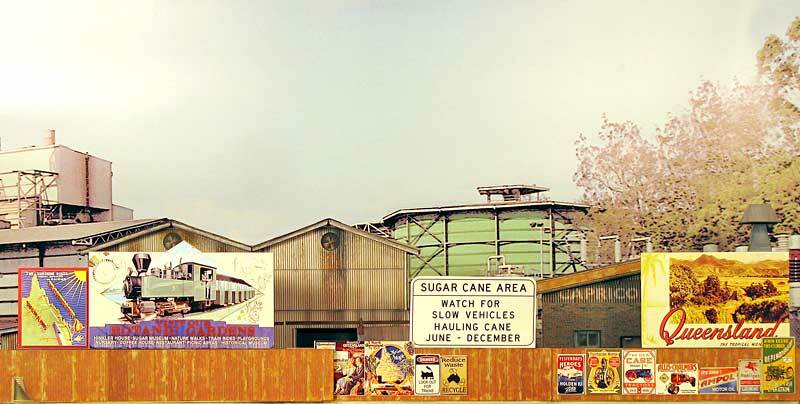 While the sugar mill tramways primarily transported workers, rather than the general public, Queensland's shire-owned tramways primarily operated passenger services. Two Buderim Shire tramway carriages were built for a colleague working on a museum display to accompany the cosmetically restored Buderim Shire Krauss locomotive. He required HO scale carriages but I also built a set in O scale for CSRM use. They are currently (2016) on display at the Archer Park Rail Museum in Rockhampton.